If you have been following the recent political campaigning for the snap election on June the 8th, you may have read about the recent criticism regarding the Conservatives ‘Dementia Tax’. This policy, which may require the elderly to pay for their care at home with the value of their house, has come under fire by opposing political parties and the public alike. The policy coined the name ‘dementia tax’ due to the likely-hood it will be the sick and elderly who will face the brunt of this new policy. As many people would also like to leave their home to their families once they pass on, this proposal seems to have struck a chord with many British families. In response to the negative press the Conservatives received for this policy, they decided to use Google Ads to advertise their own version of the policy under the title ‘The So-Called ‘Dementia Tax’ – Are You Getting the Truth?’ whenever someone googled the phrase ‘dementia tax’. Here’s a look at why buying Google Ads for ‘Dementia Tax’ backfired on quite a big scale for the Conservatives. Despite the general consensus, Dementia Tax is not the actual term for Theresa May’s policy. However, by buying the adverts for the ‘dementia tax’, the term has now become legitimised with around 448,000 exact match results on Google Search. By legitimising the term, this also provided journalists with every right to run articles with the term ‘dementia tax’ which lead to an onslaught of articles criticising the Conservatives tactics. A lesson to take away from this if you’re looking to use Google Ads for your business is to ensure you bid for the correct term and provide users with the exact thing they are searching for. The issue with the Conservatives advert was that if someone was searching for ‘dementia tax’, they most likely already knew about the negative press the term was receiving. 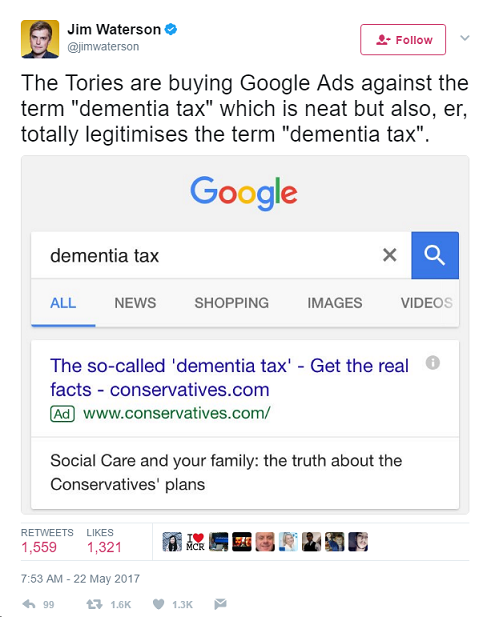 Soon after it was discovered that the Conservatives had bought a slot on the front page of the ‘dementia tax’ search, with their article ‘The So-Called ‘Dementia Tax’ – Are You Getting the Truth?’, the Labour Party also bought their own Google Ad for ‘dementia tax’. Their article named ‘The Dementia Tax – Get the Real Facts’ with a meta description ‘The Tories Have Failed to Tackle the Social Care Crisis’. Not only did this article undermine the Conservatives article, it also made it clear to the public that these were bought adverts. Because it is an advert, it may lead the users to believe they will receive a skewed version of events by clicking on it. Traditionally, Google Ads are used by businesses that wish to advertise what they’re selling. This is because the sale of their products will even out the cost of the advert. 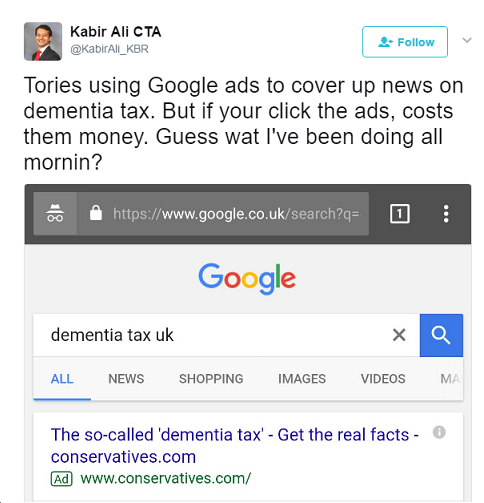 In the case of the ‘dementia tax’ Google Ad, the conservatives are not gaining any revenue through their Ad and are instead losing money advertising for this term because it is purely just information on the policy. Another unintended effect of this campaign was that some Twitter users even proclaimed they would click on the ad only to lose the Conservatives money. As can be seen in the pictures above, Google Ads come with a neat little ‘Ad’ box in light green next to the article. This makes it obvious to the user that this search engine result is an advert which has paid to be in the top position. Although it has been found that 64.6% of people click on Google Ads when they are looking to buy an item online, this may not work as well when the advert is for an article. Many users will have a preference for their source of journalism, and so might bypass the Conservatives ‘dementia-tax’ Google Ad altogether. Advertising about policies is marginally more difficult than advertising a product, and the Conservatives lack of understanding in this department is what led to their downfall with this campaign. After reading this list of how not to use Google Ads, if you did want some help with your own PPC Advertising our experts are here to help. To request a quote for help with PPC, just click here. At this year's Google Marketing Next Keynote 2017, Sridhar Ramaswamy, Bhanu Narasimhan, Bill Kee, Karen Yao, Roshan Khan and Jennifer Liu announced a range of new and exciting Google updates which will be provided to the public before the end of the year. Many of these updates strive to make many everyday marketing tasks quicker and more accessible to everyone, alongside working to improve every businesses conversion rates. If you happened to miss this year's Google Marketing Next Keynote, we've put together the top 10 useful features and insights we took note of while watching the presentation. Google lens will now allow you to view the world through Google. Whether it is a restaurant you want to see the reviews for, a flower you don’t know the species of or the password on a wifi router, simply direct your Google lens at it and all the information you need to know will become available. With each second your page needs to load, the bounce rate increases by 20%. Google is introducing the option to have new AMP landing pages wich will speed up your ads vastly, leading to an increased conversion rate. 70% of people search for something before they buy it, so it is in your best interest to ensure your ads are the first thing they see. Google will soon be introducing location extensions to the general public, which means that when your video advert is displayed, your businesses location, opening times and distance away from the nearest store will appear beneath the video. This will hopefully improve the rate of consumers visiting businesses in person, which can then be tracked through the store visits data Google introduced 2 years ago. 91% of people decide to buy a product after seeing a relevant ad, which is why Google are introducing two new tools which will allow you to see how your ads directly related to offline sales. The first will allow you to import transaction data into AdWords to see store sales and revenue at the campaign level you use for search and shopping campaigns. The second new tool will allow you to take advantage of Googles 3rd party partnerships to get store sales data. Their partnerships cover 70% of credit and debit card transactions in the US, and paired with the previous store visits Google map data, this new feature will be able to link offline purchases to online ads. New Customer Pattern and Life Event data will help businesses understand where people shop and when life's biggest events take place such as graduation, moving and getting married. This key information will allow businesses to make their ads even more targeted to their key consumers. Instead of all your data being based on last click attribution, Google Analytics will soon let you see precisely what adverts lead the consumer towards buying your product. Therefore, instead of the analytics stating your consumer came through organic traffic, you will now be able to see if they saw an advert for your product 1 week ago, watched a youtube video for your product, had a retargeted ad and then finally searched for your product directly. Through unique reach information, you will be able to see exactly how well your adverts performed which will contribute to making more precise marketing decisions in the future. It has been found that there is a shocking 40% higher bounce rate from mobile landing pages when compared to desktop. Google is working to improve this figure with new landing page features on Google 360. A new landing page tab will include reports about each of your current campaigns, so you can keep an eye on it at all times and pay attention to the pages that are not performing as well as they should be. Adwords will also be integrating with Google Optimize, meaning different variants of your landing pages can be tested on different members of your audience. This A/B split testing is available for use on web pages at the moment, but bringing it to landing pages is sure to provide the most insightful analytics for business. This feature will use machine learning to analyse past campaigns and recommend the right inventory, audiences and budget based on your goals. It will also provide an estimated impression volume and reach, which will be a useful insight for many campaign managers. This is currently available in beta and will be provided to all customers in the coming months. The Google Assitant is getting smarter and can now tell you precisely where you can find a shop selling the product you are searching for. If a company would like their business information to be available to Google assistant, they must submit their local inventory data to Google. Google Assistant will then be able to provide your consumers with directions, opening times and price of the product consumers search for. With 20% of all searches now being made by voice, this update will be widely useful for many businesses across the globe. If you'd like to use some of these new features for your business but need some guidance, then you've come to the right place, our development teams and SEO team are already working with these features and can help your business take advantage of them too. Contact us today to request a website optimisation quote. Late last year, Google released a free version of Google Optimize on an invite-only basis. However, in April 2017, Google Optimize was released globally to the general public without the need for an invitation. This is big news for website owners because Google Optimize is a free A/B testing platform which allows you to quickly create and test different variants of your web pages to see which versions are most effective. This will be a great benefit to many businesses as it eliminates the need for hours of tedious coding, testing and analytical analysis. If you're new to this tool, read our handy step-by-step guide to Google Optimize below - remember, if you don't want to use this tool yourself, our SEO experts can perform split tests for you in order to improve your website's performance. Let's say your website isn't doing as well as you'd like and you want to change a few things to see if you can boost your conversion rate. Instead of completely replacing your old web page with a new version, Google Optimize allows you to create an alternate version of your web page and set it to be shown to some of the people who visit it. The rest of the time, the original version of the page will be shown. This A/B testing experiment allows you to see which version of the page works best; all you have to do is tell Google what your 'goal' for that page is (e.g. a purchase or enquiry form submission), and Google Optimize will measure which variant is better at achieving the goal. To put it simply, Google Optimize allows you to edit the look and content of your pages and test parallel page variants without writing a line of code yourself. Experiments can be set up in minutes, and they will begin gathering data right away. One of the best features of Google Optimize is that it is integrated with Google Analytics, making it tremendously easy (assuming you already use Google Analytics) to review the data your experiment generates. In order for Google Optimize to work, you first need to add the Optimize snippets to your website. This is essentially a line of code that must be added to the Google Analytics tracking code that should already be on your website. You can find your snippet by going to the Container page on your Google Optimize account and clicking ‘Install Optimize Snippet’. From that point, you will be able to click ‘View Snippet’ which will provide you with a modified Analytics tracking code to use. To run experiments on your website, you need to add the snippet to the HTML code on the pages you want to experiment on. Be sure to place it as early as possible in the source code. For more information on how to complete this step, just click here. You may need to ask your web developer to add the code for you. Once you have created your Google Optimize account and added the snippet to your website, you will be able to find a blue button that says ‘Create Experiment’ on the Container page. For the purpose of this guide, we're going to focus on the A/B test option as this is probably the one you'll use most often. This is where the magic happens! At this stage, you will be able to create the different variant(s) of your web page. To get a good understanding of how well a page is working, ensure there is an even split between the variants and the original version. Make sure you set objectives prior to running the experiment to ensure you get as much information out of the test as possible. After this stage, you can edit your variation with Optimize's visual editor tool. Once you've downloaded the Chrome extension, you can start to edit the text, layout, fonts, colours, and many other parts of your page - basically, implement any change that might make the page more likely to achieve its goal. Once you have finished retooling your page, you can click 'Save' to go back to the experiment page. You are then free to create another variant or start running the experiment with the variants you've got. Google recommends letting your experiment run for at least 2 weeks before analysing the results, but the longer you run it, the more data you'll gather and the more confident you'll feel when you declare which variant works best. Especially if you’re editing a page that tends to get fewer views than others, it may be best to run your experiment for quite a bit longer than 2 weeks. When your experiment has ended, you will be provided with data on the level of improvement, the number of sessions, and the probability that each variant will perform better than your original page. As you can imagine, this information is incredibly useful as it enables you to make the best possible decision when it comes to testing the new features of your website. Many inspirational business success stories start with humble beginnings, and my handmade cake business is a textbook example of how something small can grow into something huge. Ridiculously Rich (or Narna's Cakes, as it was known in the early days) started in the kitchen of my parents' home in Aberystwyth. Inspired by a chocolate-making book given to me by my mum, I began whipping up my own sweet treats when I was still in my teens, and after some early success selling homemade cakes and chocolates to my friends I felt compelled to take things further. I would make all sorts of tray bakes - brownies, rocky road, that kind of thing - and sell them at local markets and other events in Ceredigion and the nearby area. This proved to be a good way of making money, and people seemed to like what I was offering - so much so, in fact, that I was eventually asked to supply a couple of local shops with goodies to sell! From there, my business grew and grew. As you may be aware, Ridiculously Rich is now co-owned by Lord Sugar, who invested £250,000 to help grow the company into a nationwide success. When I became the latest BBC Apprentice winner, I think a lot of people were surprised by Lord Sugar's decision to invest in what began as a small homemade cake business, but his faith in me is already paying off, and with our regional ambassadors now representing the Ridiculously Rich brand all over the UK there are even bigger and better things still to come. While Narna's Cakes started out as a grassroots, do-it-yourself sort of enterprise with little to no online visibility, the Internet has been crucial in getting the business to its current level, and our online efforts will continue to form a very important part of Ridiculously Rich's future success. Modern technology - the hyper-connectedness, via the Internet, of everyone and everything - makes it easier than ever to grow a small business into a big success; no matter where you live or what sort of niche you occupy, there are all kinds of opportunities now available to people who know how to seize them. I hope that these tips will inspire you and help your business (whatever that might be) to reach new heights online. 1. Start with a winning website. 2. Think carefully about keywords. And so on. Once you've got a list of keywords covering every aspect of your business (every product you sell, every service you provide, all the different words people might use, etc. ), paste that list into a tool like Google's Keyword Planner to find out how popular each keyword is. Use the most searched-for phrases on appropriate pages of your website, ensuring that each keyword is represented on one page only - if done properly, this will get your site showing as a result for each of the terms you targeted. This is another area where it's a good idea to consult a professional web developer - they will have a good grasp of SEO (Search Engine Optimisation) and know exactly how to fine-tune your website in order to maximise your chance of ranking highly within Google's results. Beware, however - many of the companies out there claiming to be optimisation experts are actually just salespeople looking to make easy money. Make sure you ask them for examples of times where they improved a client's traffic and sales, and don't be afraid to ask for a reference from the customers they name. 3. Be seen on social media! Google isn't the only tool people use to find things on the Internet - social media, too, can be a huge driver of leads, purchases, and brand awareness. There are many different social media platforms to choose from (Twitter, Snapchat, Facebook, Instagram, LinkedIn, Google+, Pinterest...) and while some people manage to do well across all of them, it's generally a better idea to pick the handful of social platforms that best suit your business and focus your energy on them. For instance, if you sell very aesthetically appealing products, it might be a good idea to promote them on Pinterest, whereas a less visual business may do better by joining conversations on Twitter and advertising their professional credentials on LinkedIn. Snapchat and Instagram are good for sharing photos/videos of the inner workings of your company, while Facebook pages are great for collecting customer reviews and interacting with your audience via messages and comments. Whichever social site you choose, be sure to stay active once you've set your account up. If a potential customer searches for your business and finds a Twitter feed that hasn't been updated for months - or a Facebook page on which people's questions are going unanswered - this may damage that customer's perception of your organisation. But OK - all of your competitors have websites, all of them are on Twitter, and all of them are going after more or less the same Google keywords. What can you do to really distinguish yourself from the other businesses in your industry? Once you've established your business online, there are all kinds of different ways to grow your business. All you need is an idea! This could be an unusual, attention-grabbing social media campaign that portrays your brand in a good light, or it could be a huge business initiative that leverages the Internet's ability to connect people across huge distances. Whatever you come up with, the infrastructure to do it almost certainly already exists online. You may need some help from your web developer to turn your ideas into realities, but don't worry - a good developer will always be up to the challenges you set them! Here's one example. As mentioned above, Lord Sugar and I recently started selecting regional ambassadors to represent the Ridiculously Rich brand at food festivals, farmers' markets, and other local events across the UK. Would-be ambassadors apply online, and if they're selected, we send them everything they'll need to set up their very own Ridiculously Rich stall and sell our cakes in their area. By promoting this money-making opportunity online, we're able to reach eager cake lovers in every corner of the country, and each approved ambassador gets their own dashboard on the Ridiculously Rich website to help them manage everything. This initiative has already proved hugely popular, and it looks set to grow even more over the coming months! 5. Provide the best possible service at all times. While it is possible for businesses to achieve massive growth via online marketing avenues, that growth is often accompanied by a decline in quality. When you've got a bricks-and-mortar shop that only serves people who walk through the door, it's relatively easy to ensure that each customer has a good experience; when you're serving thousands of people online and sending your products all over the world, it's far harder to maintain that high standard. Keep an eye on your website. If people are interacting with your website instead of an actual company representative, it's up to you to ensure that your site is doing a good job. Be sure to look at the site on a regular basis to make sure that nothing has gone wrong; you may also want to register your site with Google Search Console, as this will inform you if there are any issues that may affect user experience and/or Google rankings. Choose your courier wisely. Do you send products to your customers through the post? If so, it's crucial to select a courier / delivery service that will do you proud. Above all, the two factors that will most affect the customer's lasting impression of your business are 1) whether their order arrived on time, and 2) whether it arrived in good condition. This is partially up to you, of course - you're responsible for ensuring that everything is packaged properly and posted promptly - but all your hard work may be spoiled if you leave the final stage of the ordering process in the hands of someone who's happy to let your customers down. Be sure to do your research - other companies will have left reviews online to help you avoid shoddy services. Handle any complaints in a speedy, polite, and helpful manner. Just about every business gets the occasional complaint or bad review - it's not the end of the world. In fact, it's possible to turn a negative comment into something positive if you (or the person you've appointed to interact with customers) handle the situation properly. Be polite and apologetic and do your best to resolve the problem in any way you can. Your aim should be to make the unhappy person happy, but if you can't do that, you can at least demonstrate to other people who read the bad review that you take customer satisfaction seriously and don't take complaints lying down. The team at Designer Websites, who I've been working with recently, gave me a lot of great insight into the world of doing business online and how to do it properly. If you're keen to grow your business online, I would definitely recommend them! If you followed the most recent series of the BBC Apprentice, you'll most likely know all about Alana Spencer and her business Ridiculously Rich by Alana. Last year, Alana triumphed over a number of other eager entrepreneurs to win the twelfth series of the hit show, resulting in a £250,000 investment from Lord Sugar and a dream opportunity to grow the business she started while she was still in school. Ridiculously Rich sells Alana's popular and deliciously luxurious cakes, and on her new website, you can now apply for the exciting opportunity to become an ambassador or wholesale distributor of her products. One of the best features on the new Ridiculously Rich website is an interactive map that allows you to find out which food markets and events are happening near you. This feature is totally mobile-friendly, so you will be able to stay up to date wherever you go! Alana is, in fact, the fourth BBC Apprentice winner we've developed a website for. Over the years, we at Designer Websites have also developed websites for 2012 winner Ricky Martin and his business Hyper Recruitment Solutions; 2013 winner Dr. Leah Totton and her business Dr. Leah Clinics; and 2015's winner Joseph Valente and his business ImpraGas. I'm really pleased to now have a fantastic new website where I can sell my Ridiculously Rich cakes. The best parts about the new website are that people can now apply to become ambassadors or wholesalers of my products, which I think will be an exciting adventure for everyone involved. There's even a feature for ambassadors to see who the other ambassadors are near them and when the next foodie events are, which will be great for keeping everyone in the loop! Designer Websites was recommended to me by the previous BBC Apprentice winners they have worked with and I'm so glad to have been introduced to them. The new website looks lovely and has all of the great features I was looking for. Designer Websites were a delight to work with and I will be more than happy to recommend them to anyone one else seeking a web development company. Thanks for the lovely review, Alana! The whole team here at Designer Websites would like to wish Alana and her business partner Lord Sugar the best of luck with Ridiculously Rich and these new ventures. If you'd like to have your website designed or revamped by the Designer Websites team, we'd love to hear from you. Call us on 01446 339050 or request a quote here. In this day and age, it's a good idea to ensure your business is reaching potential customers on every platform possible. We've already discussed the importance of social media on this blog, but today we'd like to get a little more specific and focus on how to use Snapchat for business. Image and video messaging platform Snapchat has been mentioned in a lot of news stories lately due to Facebook and Instagram's newest features, which some argue bear a lot of similarities to the Snapchat app. Of course, Snapchat is hardly new - it was first introduced in 2011 - but it still has a huge user base, and it should probably be your first choice when it comes to building your social media following through video. If you're wondering how to effectively use Snapchat for business purposes, don't worry - we've put together some simple yet very useful tips for you to follow. It may seem daunting, but video content is the future of content marketing, so it's definitely worth getting a handle on the likes of Snapchat sooner rather than later. One great way of gaining engagement and revenue through Snapchat is to offer special discounts and sneak peeks of your latest products via your business's Snapchat account. 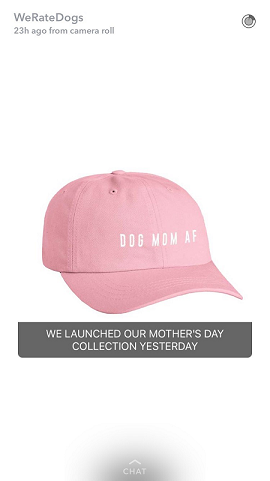 As you can see above, WeRateDogs has taken advantage of this feature by promoting their new range of merchandise. Snapchat is a superb social media platform for this kind of promotion because it allows users a literal 'peek' at forthcoming releases. If you were to post on Twitter, Facebook or Instagram instead, the post would be much more permanent, thus undermining the 'sneak peek' element. Many businesses also use their accounts to provide 'secret' discounts to those who follow them on Snapchat. This is a great way to gain more followers on the platform - if you tell people about the exclusive discounts available through your Snapchat account, people will inevitably follow you in the hope of bagging a bargain. Snap contests are one of the most engaging ways in which you can use Snapchat for business. The beauty of Snapchat is that as well as using the story feature (which allows everyone to see what you post), consumers are also able to send you snaps directly. This feature makes snap contests a great way of utilising the platform. Back in 2014, GrubHub displayed a great example of how to use snap contests to promote one's business. They created a week-long campaign called a "snap hunt". Every day of that week, GrubHub posted a new challenge for their followers to complete and send back to them. Whoever they chose as winners would gain a $50 voucher to spend on takeaway food. This competition was a big success, and Grubhub found that over 30% of their followers engaged in the contest, with their account gaining a 20% increase in followers in just one week. This proves that a well-thought-out contest (and the promise of freebies) works wonders when using Snapchat for business. In any business, it is easy for consumers to forget about the human aspect of the company. This is why an inside look at your office, products, and workers is a great way to use Snapchat for your business. Many studies have found that people buy stories before they buy products, which is why displaying your company's story through a modern platform like Snapchat is one of the best ways to encourage customer engagement. Take Justin Kan, for example - he is an American entrepreneur and co-founder of Justin.tv, Twitch.tv and Socialcam. Kan uses Snapchat frequently to take his customers on a guided tour through his companies and the new venues he visits. He also shows snippets of himself mentoring young entrepreneurs, which really displays the human side of his businesses. Taking your consumers on a backstage tour has never been easier, so take advantage of this when using Snapchat for your business. Social media influencers are popular accounts who have a substantial amount of influence over their followers. Gaining the approval of one of these influencers can benefit your business greatly. A valuable way to use Snapchat for business is by asking influencers to promote your business on their own account - you can ask them to rate, review or even try out a freebie from your company. Above is an example of how Beth Norton, a popular lifestyle blogger, has promoted Zoe Griffin Photography through Snapchat. Promoting the use of this photographer through her Snapchat not only displays her approval but also encourages others to use this particular photographer. 5) Keep it short and snappy! With some studies stating that the average human attention span is only 7 seconds long, you'll want to ensure that your story is kept short and snappy. Snapchat limits videos to just 10 seconds, and it's not a good idea to post too many of these onto your story in one day. Snapchat works in seconds, not minutes - so always ensure that the entirety of your story clocks in under the minute mark. Snapchat users can flick through your story with just a movement of the finger, so make sure you get all of your good content into the first few seconds of the video. 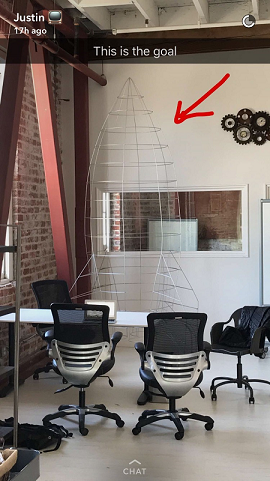 Spending 5 seconds setting the scene could cause users to flick onto the next snap before they even see the main point of your story. If you take one thing away from this blog, remember that on Snapchat, every second is important! Need help harnessing the power of social media to benefit your business? Our social media experts can help!